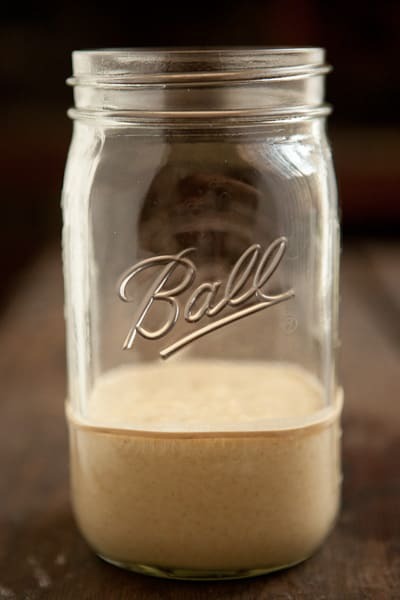 The first step to making sourdough bread from scratch is to culture a sourdough starter. This is simple to do and requires no special equipment or exotic ingredients, but it does take some time – anywhere from 4 to 7 days. 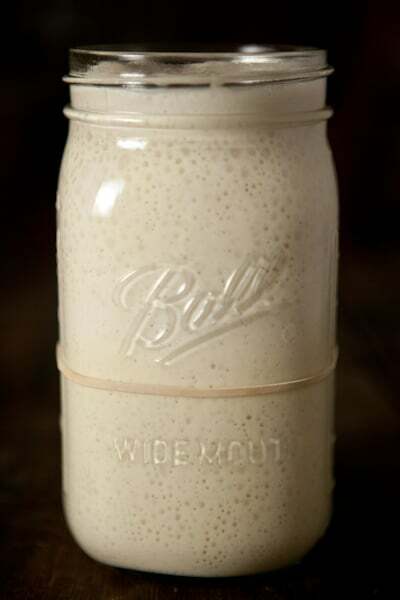 A sourdough starter is a simple batter of flour and water that contains wild yeast and good bacteria living in harmony. The yeast and bacteria work together to make the bread rise and give it a distinctive and delicious flavor. During the culturing process, we are trying to encourage the growth of wild yeast and certain benign bacteria. It’s a symbiotic relationship – these wild yeast thrive in an acidic environment, so they like the lactic and acetic acids produced by the bacteria. The yeast helps our bread rise, but it’s the acids produced by the bacteria that give the dough that distinctive sourdough tang. Although it is commonly believed that we are trying to catch wild yeast from the air (and it’s true that wild yeast are everywhere), the truth is that the yeast is already in the flour. From what I understand, whole grain flour, especially rye, is a better source of this wild yeast than white flour, so that’s why we will start with whole rye or wheat flour. Fruits, such as grapes, are also great sources of wild yeast, so you’ll see lots of different methods for cultivating a starter, including ones that use wild grapes. No method is better than any other. You can try whichever one sounds good to you and it will be the right way as long as you end up with a jar full of a bubbly batter that smells pleasantly sour. The method outlined below is Peter Reinhart’s from The Bread Baker’s Apprentice, but it is a bit different than what’s in the book. That’s because he updated the method after the book was published and shared the correction on his blog. So, I’m sharing Mr. Reinhart’s updated instructions with a few small changes of my own. It worked for me and I blogged about the process. Click on the links below if you’d like to read about my experience and see step-by-step photos. Day One: In a small bowl, mix one cup of whole wheat or whole rye flour with 3/4 cup (6 oz) canned pineapple juice (at room temperature) until all of the flour is hydrated. Scrape mixture into a quart-size wide mouth glass container, such as a jar or a large glass measuring cup. Mark the level of the starter with a piece of tape or rubber band. Cover the container with a paper towel, cheesecloth, or coffee filter and secure with a rubber band (or just cover loosely with jar lid). Leave at room temperature for 24 hours. Click here for photos and more details. Day Two: You probably won’t notice much change at this point. Scrape the contents of the jar into a mixing bowl and add 1 cup of unbleached all-purpose or unbleached bread flour plus 1/2 cup pineapple juice (make sure juice is room temperature). Mix until all ingredients are evenly distributed. Wash and dry your glass container and scrape the mixture into the container. Mark and cover the container just like day one. Let sit at room temperature for 24 hours. Click here for photos and more details. Day Three: You may notice some activity at this point. The mixture may have risen some and there might be bubbles. Regardless of whether you notice any fermentation or not, discard half of the mixture (or give it to a friend to cultivate), and mix the remaining half with 1 cup of unbleached all-purpose or bread flour and 1/2 cup filtered water (make sure water is room temperature). Wash and dry your container and scrape the mixture into the container. Mark and cover as before. Let sit at room temperature for 24 hours. Click here for photos and more details. Day Four: The mixture should have at least doubled in size at this point. If it seems to be sluggish and hasn’t doubled in size, allow it to sit at room temperature for another 12 to 24 hours. Otherwise, repeat instructions for Day three. Click here for photos and more details. Day Five: Feed the starter (repeating day three instructions) first thing in the morning and then again in the evening (about 12 hours apart). Click here for photos and more details. Day Six: If your starter has been very active and always doubles in size (or more) between feedings, then it is ready to bake with. You may also choose to refrigerate your starter at this point and slow down the feedings to once a week. 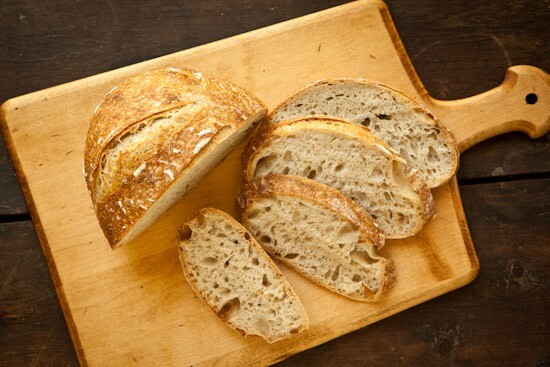 If you’d like to bake some bread, here is a basic sourdough bread recipe to get you started. If your starter still seems a little sluggish, continue with the twice daily feedings as above. Click here for photos and more details. Day Seven: Same as above. Click here for photos and more details. So, let’s talk a bit more about what actually happens during this experiment. Although I’ve been referring to my jar of bubbly batter as a sourdough starter throughout the posts, it’s technically called a culture until it’s strong enough to bake with. Once it’s mature, it becomes a real sourdough starter, also known as a levain. But I think it’s fun to come up with your own name for your starter once it has matured. The last one I cultured at home was named Lyle (after Lyle Lovett, of course). Once you have a robust starter, you won’t have to keep feeding it twice a day (I’m sure that’s a relief!). You can safely store your starter in the refrigerator, where it will slow down then basically go dormant. It’s recommended to take it out and feed it once a week to keep it healthy, especially if it’s a newly established starter. You can also dry or freeze small amounts of it to keep on hand in case you do accidentally kill the poor thing. However, I’ve found that once you have a good strong starter, it’s pretty hard to kill as long as you keep it refrigerated. Although the culturing process I describe above uses white flour for feedings, it doesn’t mean you can’t keep a whole wheat starter. You can feed your starter with whole wheat from the beginning and keep it that way or you can convert a white starter to whole wheat by changing its diet (and vice versa). There are no hard and fast rules when it comes to sourdough. Experiment and have fun!